Jesse Stewart is an award-winning composer, improviser, percussionist, visual artist, instrument builder, researcher, writer, educator, and community activist dedicated to reimagining the spaces between artistic disciplines. In 2008, he joined the Carleton music faculty where he teaches courses on music composition, jazz history, music and social justice, improvisation, music and visual culture, and popular music studies. 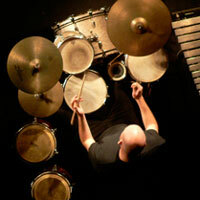 As a composer, he writes mainly for percussion, found objects, and instruments of his own design. His music explores extended playing techniques, just intonation and tuning theory, the limits of musical notation, and the interface between music composition and improvisation. Also an active performer, he has performed and/or recorded with musical luminaries including George Lewis, Roswell Rudd, Hamid Drake, Evan Parker, William Parker, Pauline Oliveros, David Mott, Malcolm Goldstein, Jandek, Pandit Anindo Chatterjee, Michael Snow, and many others. In 2012, he was honoured with the “Instrumental Album of the Year” Juno award for his work with Stretch Orchestra, a trio consisting of Kevin Breit on guitars, Matt Brubeck on cello, and Jesse on drums. He has been widely commissioned as a composer. His music has been featured at festivals throughout Canada, the United States, and Europe and is documented on over 20 recordings. He endorses Headhunters brand drumsticks and brushes. His music has been described as “highly recommended ear- cleansing” (Touching Extremes 2007) “truly exciting” (Musicworks 76), “exceptional” (Cadence Oct. 2002), “phenomenal” (Cadence Nov. 1999), “ingenious” (Exclaim! June 2006), and “brilliant” (Truths for Serious Drummers, 2012). Texas-based music journalist Frank Rubolino described him as “…one of the finest young drummers and percussionists on the scene today” (One Final Note Summer/Fall 2002). A past recipient of the Terry Fox Humanitarian Award, he is dedicated to building and strengthening communities through arts education and outreach. In 2012, he founded an organization called “We Are All Musicians” (WAAM) that is rooted in his belief that music is a fundamental human right and that everyone deserves to have opportunities to make music regardless of musical training, socio-economic circumstance, and/or level of physical or intellectual ability. As a means to that end, he has facilitated dozens of music workshops and performances with musicians and non-musicians alike, including extensive work with children and individuals with special needs. Using a wide range of percussion instruments (including many of his own design) and several cutting-edge adaptive use instruments, the “We Are All Musicians” initiative creates inclusive spaces for sonic exploration. As a scholar, he has published widely on the subjects of music and art in academic journals including American Music, Intermedialities, Black Music Research Journal, and Contemporary Music Review. He has authored seven book chapters and is currently working on two book projects: a co-authored book (with Ajay Heble) on the pedagogy of improvisation and a single-authored book titled Jazz Plus on jazz as intercultural practice. He has given over 50 public talks at conferences, colloquia, and festivals around the world including numerous keynote presentations. He is a co-investigator with two major research projects focused on improvisation: the Improvisation, Community, and Social Practice Project (ICASP) which received a multi-year $2.5 million Major Collaborative Research Initiative grant through SSHRC in 2007 and the International Institute for Critical Studies in Improvisation (IICSI) which similarly received a $2.5 million SSHRC Partnership grant in 2013. In 2013, he received Carleton University’s Marston LaFrance Research Fellowship, the Faculty of Arts and Social Sciences’ “senior award, intended for applicants with a very significant track record of outstanding research.” In 2014, he received a Faculty of Arts and Social Sciences “Teaching Achievement Award” in recognition of outstanding teaching. Watch “Searching for Sound: The art of Jesse Stewart” produced by the School of Journalism and Communication, Carleton University.